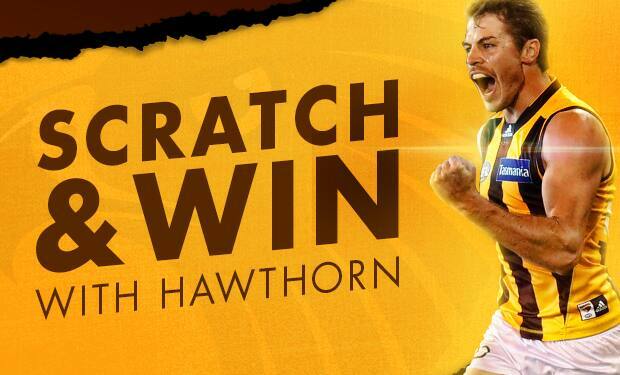 Hawthorn Football Club is offering members the chance to win $10,000 in a special Scratch & Win fundraiser. In the coming weeks representatives from Chameleon Customer Contact will be calling Hawthorn members, on behalf of the club, to find out if you would like to contribute a donation of $200 or more to our future success. Each member who donates will receive a Scratch & Win card, with one in three scratch cards revealing a winning code for a voucher to be used at the club’s online merchandise store, HawksNest. Each member who contributes $200 or more to the campaign will automatically be entered in a grand prize draw where one lucky winner will receive $10,000. Three additional winners will be invited to sit front and centre with the entire playing group in Hawthorn’s official 2019 team photo. In addition to the grand prize draw, there will be two bonus prize draws for members who get in early. By making a contribution of $200 or more prior to 06/07/2018 or 03/08/2018, members will be entered into an additional draw to win an official 2018 team signed guernsey. All proceeds raised will contribute towards Hawthorn’s 2050 Vision to secure 20 Premierships by 2050, which will only be possible with a solid financial base. There are only 1,500 Scratch & Win cards available as part of this promotion, so fans are encouraged to get in quick. Hawthorn wishes to thank all its members for their unwavering commitment and support of the mighty Hawks. Full terms and conditions are available by clicking here.